Your wrists are just as susceptible to scratches as your hands but tend to be overlooked when it comes to finding protective clothing. 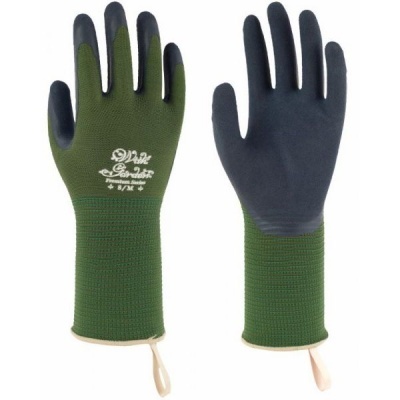 The WithGarden Foresta 394 Premium Latex Moss Green Gardening Gloves perform two tasks at once by protecting both your hands and your wrists. Designed with longer cuffs, the gloves are ideal for pruning roses, planting deep roots and cutting prickly bushes without having to worry about getting injured. If you'd prefer these gloves in burgundy, the WithGarden Foresta 393 Premium Latex Burgundy Gardening Gloves are available to purchase separately. The gloves provide all the great features of these Premium Moss Green Gloves in a different colour. These Premium Gardening Gloves are designed using MicroFinish technology, meaning they provide exceptional grip in adverse conditions. Find out more about this technology by watching the video below. The Latex Moss Green Gloves are available in three sizes to fit most hands. Please measure the circumference of your hand around the knuckles (excluding your thumb) with your palm open and your fingers together. Next, measure the length of your hand from the tip of your middle finger to your wrist.